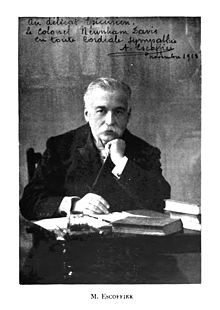 Auguste Escoffier began his long and distinguished professional culinary career at the age of 13 and retired 61 years later. During his lifetime, he made French cuisine world famous. Escoffier revolutionized and modernized menus, the art and practice of cooking, and the organization of the professional kitchen as well. Three of his cookbooks are still regarded as indispensable references. His culinary innovations included abolishing ostentatious food displays and elaborate garnishes, reducing the number of courses served at a formal meal, lightening sauces and emphasizing seasonal foods. While respecting and preserving the principles of classical cuisine, he simplified its practice, saying, "Because it is simplified on the surface, it does not lose its value. On the contrary, tastes are constantly being refined and cooking must be refined to satisfy them." He also restructured the kitchen so that it operated as a single integrated unit, a system that prevails today. From medieval times and up to Escoffier, the professional kitchen had been composed of separate independent sections, operating autonomously, which resulted in duplication of labor, waste of food, and inconsistent quality. Escoffier's prestige had the ripple effect of elevating the status of cooks from laborers to artists. Kaiser Wilhelm II once said to Escoffier, "I am the Emperor of Germany, but you are the emperor of chefs." Hotelier César Ritz , whom Escoffier met in 1884, provided not only the stage for the young chef's talents, but also the audience. Ritz's illustrious Savoy and Carlton Hotels' kitchens were headed by Escoffier during an era when the international clientele included the rich, the powerful and the famous. Ritz and Escoffier redefined restaurants and raised hospitality to unparalleled heights. Escoffier's contributions to culinary art included founding magazines and writing books; the best-known are guides for the modern chef: Le Guide Culinaire (1903), Le Livre des Menus (1912), and Ma Cuisine (1934). On the social front he organized programs to help feed the hungry and financially assist retired chefs. Escoffier's professional stature was recognized by the French Government, which made him a Chevalier of the Legion d'Honneur in 1920 and an Officer in 1928. His memoirs have now been translated into English.